The second race was also started in wet conditions and a light east, south- east breeze. Reliance >again sailed away from Shamrock III and three quarters of the way up the beat to the weather mark it looked like another dismal day for the challengers. Then the wind died out. Both yachts sat becalmed on an ocean reflecting the sullen cloud cover and thousands of spectators sipped their champagne and wondered if the race day was over. And then keen observers noticed fingers of a light northerly breeze approaching from the distant Long Island shore. Eventually the sails filled on Shamrock III and the challenger began to close on the defender, which still sat becalmed near the weather mark ship. Very soon Shamrock III was inside the defenders one minute 57 second handicap barrier. Every observer, to say nothing of skippers and crews, realised that the race was on again. The first fingers of the new light breeze reached Reliance in time for her to squeeze around the mark less than 30 seconds ahead and begin what was now a lay through to the Sandy Hook light vessel. Only ten minutes into this leg the breeze began to move toward the northeast, coming further aft to the yachts course and allowing sheets to be eased. There was still only five or six knots of wind speed but Reliance was again in her element and began to open the gap on Shamrock III. A break in the continuous cloud cover heralded shafts of sun light, another slight increase in breeze and a dramatic shift further aft until it was back to the direction at race start, east by south-east. 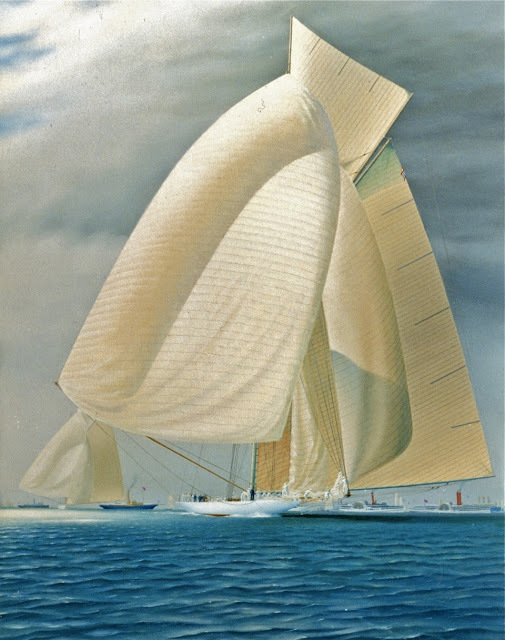 The painting 'New Breeze' re-creates the action at this point in the race. Shamrock III was first to set a spinnaker and again began to close on the race leader. But the wind shift further east also brought more pressure and very soon the crew of Reliance were setting their spinnaker, dropping flying, inner and outer jibs and setting the huge free luff running headsail. With the after-guard still cautious about wind shifts, the three headsails not in use were flaked out and tied to the enormous bowsprit and on the foredeck, ready for re-hoisting. Provided the breeze stayed in, Reliance looked a certain victor in the second race.